The Crave TV show Letterkenny has become a cult favourite over the past couple years. 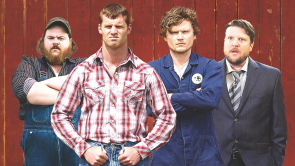 It follows the misadventures of “hicks,” skids” and “hockey players” hanging around the fictional Ontario town of Letterkenny, usually around the main character Wayne (played by series creator Jared Kesso)’s produce stand where he is joined by his friends Daryl (Nathan Dales), Squirrley Dan (K Trevor Wilson) and Wayne’s sister Katy (Michelle Mylett), who discuss the minutia of life in between “chirping” with the local hockey players and meth addled skids. It is like a mix of Seinfeld, Corner Gas and the Trailer Park Boys set in the country. Letterkenny Live! The Encore brings the live experience to the Enmax Centre, Dec. 14. “I met Jared in Vancouver and we started making two minute Youtube videos called Letterkenny Problems, which became really popular and the TV show came after for Crave TV. And now we’ve been doing them for three years. We never expected that to happen,” said Calgary born actor Nathan Dales, who splits his time working in Vancouver and shooting Letterkenny in Toronto and Sudbury. “We‘re shooting season six now. When that’s done we’ll go on the encore tour because the first time was so successful,” Dales said, adding the live Letterkenny experience is a different than the televised version. “We’ll be bringing the produce stand, so K Trevor Wilson, Jared Keeso and I will be in lawn chairs in front of the produce stand doing some of the favourite bits from the show. We’ll have new video and K Trevor Wilson will be doing a set of stand-up comedy,” he said. Mark Forward, who plays coach in the show will also be doing a stand-up comedy set. “The Letterkenny Live is like theatre. You get an instant reaction from the audience, good or bad. It’s something really special,“he said. Dales said he is similar to Daryl. “I’m a lot like Daryl. He’s a supportive friend,” he said. Bad news everybody. While local performers, arts groups and theatrical groups were really looking forward to being able to utilize the Blank Space theatre (located at Unit 3 1416 2 Ave S) for upcoming performances, especially after getting an advance peek at the place at the opening gala, Nov 1, the space has been put on hold due to obstacles arising with the City of Lethbridge. Two important fundraising shows have been cancelled as Black Space looks for a new location. Volunteers spent Sunday dismantling the space. The Gin Game, set to run Nov. 13-18 and Nov. 20-24 was the first to be cancelled. And unfortunately, they have also had to cancel an innovative production of A Christmas Carol, originally scheduled for the first two weeks of December, which would have had six actors playing all of the roles in the beloved Christmas story in front of a minimal set and utilizing music and props to convey the different characters. A Christmas Carol Director Juanita DeVos is “gutted” by the news. “We are now forced to do what we and every other small performance in Lethbridge has had to do for years: rent space in a venue that is not designed or zoned for the purposes of gathering people and equipment together for a performance... because we are not allowed to use our space which is not (yet) designed or zoned for the purposes of gathering people together for a performance,” she wrote on the group’s Facebook page. To paraphrase the opening of the’80s TV show the A Team “If you’re an dramatic group, dance troupe, musician or an artist and have no place to perform rehearse or display your work, maybe you can hire — the Blank Space (located at Unit 3 1416 2 Ave S). 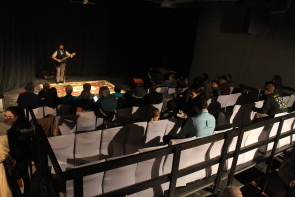 The new artistic venue opened its doors, Nov. 1 with live music and a scene from their first production of Hatrix Theatre’s upcoming presentation of the The Gin Game, Nov. 13-18 and Nov. 20-24. The 1976 Donald L Coburn penned Pulitzer prize winning production, which won the 1978 Pulitzer for drama, stars two experienced actors Vicki Gibson and Dave Ranson. “It’s a two hander, so it’s two people on stage for two acts,” described director Brian Quinn. “I did it once before in 1981 or 82. I wanted to do it again because it is a good play, a funny play and it’s even more relevant now to me as a baby boomer and a lot of people of the baby boomer age,” Quinn described. 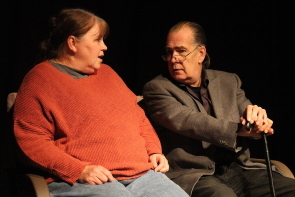 “It’s about two people, Weller Martin and Fonsia Dorsey who meet in a nursing home and talk about their lives before and at the nursing home, it‘s a very funny play. it‘s very well written and witty too, he said, adding he had trouble casting actors for the parts. “The first time I did it , I had to age my actors who were in their late 20s and early 30s, with latex and makeup. We’ll have to age these actors a little,” he said adding the play requires a lot from the actors, if only because of the number of lines to remember. “In community theatre, they have to balance work and finding time to learn lines. I’ve had actors who read lines in the bath tub because that’s the only time they have to do it or else right before bed. They have to create the characters on top of that,” he said. They have both been involved in other Hatrix productions as Ranson was also in Little Shop of Horrors and several LMT shows. Gibson was in 12 Angry Jurors and was in Les Miserables. “It’s reflective of what happens as people age,” he noted, the two irascible seniors end up bonding over the game of gin rummy. Quinn has been looking for a space like the Blank Space for several years, as, like many local groups, finding places to perform and rehearse can be a challenge, not to mention expensive. 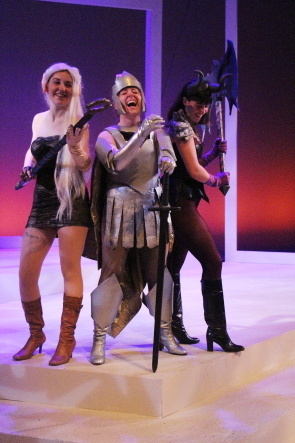 “But it isn’t just a Hatrix space, it is for any group who want to use the space,” noted Quinn, who started really looking for a space after overcoming the the challenges of trying to stage Spamalot at the Yates in 2014 as they had to work around other organizations and schools who had priority at the Yates like Lethbridge Musical Theatre. Finding a space became all the more important as a long standing relationship with the Moose Hall deteriorated at the end of last year. So Vittorio Oliverio and his investors group found the old Faith Electronics Building. “As soon as I saw it I saw the potential of it,” Quinn said.